FIXYOURTHINKING.COM / Need a brain? Borrow mine! : What The Dell? 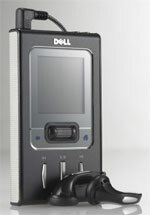 We've long since noticed Dell's lineup of hard drive-based portable audio players have vanished from their site, but this they officially commented on the death of the drive-based segment of their Dell Pocket DJ (Digital Jukebox) line and made it official that those devices were phased out over the last two months. ... they hinted at being a flash player-only shop from here on in. Yet another casualty in the war against the iPod. I was kind of blase about Creative until I saw a recent ad in the paper for a Creative Zen Nano. A Creative "Nano"??? While I understand that the word Nano may not be something Apple can copywrite, its just stupid and disrespectful for Creative to use that name. Copywritable or not, the name "Nano" clearly identifies a small player as an Apple iPod and Creative has lost whatever respect I had for them by using this name. Come on, Creative, there's thousands of words in the dictionary. Take it off the shelf. What's your next breakthrough, the Creative Zen Shuffle??? Just like Muvo from four year ago? I'm with you completely on that ... Creative also recently announced Zencasts which equals podcasts.